Blog - New York State Dispute Resolution Association, Inc. Welcome to the NYSDRA blog! This blog serves as a tool to highlight current headlines, discussion topics, best practices, and viewpoints to engage directly with statewide practitioners, volunteers, partners, and advocates. NYSDRA members are welcome to post after logging in to the website. All entries will be approved by the website administrator prior to being published. Read all about NYSDRA's board-led initiative that helps politicians cross party lines to find common ground and accomplish shared goals. The program is currently administered in Orange County by the Dispute Resolution Center. As farmers we are masters of the quick fix. We are good at mending fences on the fly and cobbling together a piece of broken equipment to finish the job before the day ends. Farm conflict, whether with family members, coworkers, employees, or even neighbors, is like any other problem we solve. Having a plan, some awareness, and a few tools can help out with the short term fixes you need to get through the day. Conflict is a normal part of any farm business. Conflicts come often when people have different values, goals, and perspectives. Conflict can be a positive force on the farm, if we manage it well. Conflict can create energy, focus and change. It can also cause us to revisit a decision and consider it more carefully. Conflict can help us understand what is important to us and to others. The way we manage conflict means the difference between the conflict becoming a negative or positive experience. Most of us are not at our best during a conflict. We say things we don’t really mean, make accusations, and refuse to hear what the other person is saying. We get locked in a narrow mindset feeling like one way is the right way and the only way. There is a biological reason for this “my way or the highway” attitude! According to neuroscience, we actually don’t have our full capacity to see multiple perspectives or make complex decisions, when we are “triggered”, or in fight, flight, freeze mode. When we are “triggered,” stress hormones flood our body and then neural pathways to the prefrontal cortex, shut down. The prefrontal cortex is the area of the brain that helps us sort conflicting thoughts and right from wrong. This is a big deal! We feel tense, irritated and unable to stop thinking in a loop. Noticing you are triggered helps you begin to shift from reactivity to managing your conflicts productively. Cool off and do nothing for a little while. Make a practice of noticing when you are triggered and in “fight, flight or freeze”. Name it. Just noticing can help you shift from being triggered. Since we don’t have access to our full capacity when we a triggered, building awareness will help you know when to take a break during a conflict instead of engaging. Reflect on the situation. Review your observations. What happened, what did you see or hear, what words were said? (think of what a video camera can see or record- just the observables). We often mix observations with evaluations and you will want to try to separate evaluations from your observations. Reflect on self. What feelings do we experience as a result of the data we observe? Usually there are a range of feelings. “I feel angry and disappointed and frustrated and most of all just really tired of the tension.” What are the needs or values that relate to those feelings? For instance, if you are feeling angry it is easy to think it is because someone did something that really pissed you off. But we are the only ones who create our response. No one can really make us angry. What is it that you were really wanting, is there a value you care about? (ex. if you are really tired of the tension you might really value and want ease and peace etc). Reflect on the other. How might the other person be feeling in relation to the observable data? What are the needs and values they might be holding that relate to those feelings? Try to put yourself in their shoes and understand the situation from their perspective. Sometimes we learn something about ourselves in the reflective process and don’t need to talk about anything. If you decide a conversation is the next step here are a few tips. Listen first. Focus carefully on what is said and reflect back the information and opinions. You don’t have to remember every detail but try to get the gist of the story. Use their words and phrasing rather than your own interpretation. You don’t have to agree with what they are saying. Check to find out if you are hearing them in the way they want to be heard. When you feel the person has said everything that they wanted to be heard about see if they are willing to hear about your experience. Share your experience. Share your observations, and the feelings that came up for you. Share what you care about now in relation to the conflict and what is most important to you? Focus on the problem or the issue and not the person. Make requests (not demands); accept a “NO” and be prepared with a second request. If you are not really willing to hear a no you are most likely making a demand and not a request. You may want to propose “experiments” to test potential solutions. If you try these things and realize you are in over your head with a situation consider “borrowing” the skills of a mediator just in the same way you might “borrow’ the skills of an accountant to help you figure out how to manage a tight financial spell. Mediators are third party neutrals trained in communication who can offer individuals conflict coaching or can offer two or more parties mediation. Even the best fences need maintenance and repairs. If a broken fence is not repaired there are going to be problems. It is not the broken fence that determines the outcome but how quickly we notice and how we choose to respond. Same with our relationships to people and conflict. When we notice a conflict, and how we choose to respond or manage a conflict, makes a difference to the outcome. Claudia Kenny has managed Little Seed Gardens with her husband in Columbia County, NY since 1995. Learning to manage conflict constructively has been vital to their farm’s success which is dependent on webs of family, labor, community and business relationships. She has her masters degree in conflict analysis and engagement and is currently statewide director of New York State Agricultural Mediation Program (NYSAMP). NYSAMP offers confidential, low or no cost mediation to the agriculture community. Mark Collins, Assistant Coordinator for the New York State Unified Court System's Office of ADR Programs, worked for 34 years to build the network of Community Dispute Resolution Centers (CDRCs) in New York; he will be retiring this month. He was responsible for the supervision of the CDRCs, program funding and evaluation, mediation trainer certification, and the expansion of dispute resolution into family courts. We also honor Mark for his role in founding and partnering with NYSDRA as a professional association, administrator of statewide programs, and as an advocate for our members and the dispute resolution profession. Mark wove the core values of mediation practice into his professional life. He remained true to the original strands of community mediation, both of which manifested during times of national turmoil and political activism in the 1960’s. One strand flowed from the need for court reform and recognition that the judiciary system was overburdened. The second strand was a broader vision of social justice, and the belief that citizens could be empowered to take control of their own lives, resolve conflict, and preserve personal and professional relationships. While providing oversight to the CDRC network to ensure quality of their processes, he supported their self-determination in terms of capacity building to meet emerging needs of their communities and stakeholders. Mark models transparency and accessibility: one of the many pearls he passed on to his colleagues was the concept of managing while walking around. Mark’s vision was grounded in practice; throughout his career he has been an ADR practitioner with a particular focus on victim-offender dialogues in serious crimes. He gained a national reputation, and served as board member and Board Co-Chair of the National Association for Community Mediation. Mark provided assistance to other state court systems in their design of community mediation networks. Over the years, Mark has been recognized by many organizations for his contributions to the field including the Lawrence Cook Peace Innovator Award from NYSDRA in 2010. Albany, NY - The New York State Agricultural Mediation Program (NYSAMP) is pleased to announce that Claudia Kenny has joined the organization as statewide director. 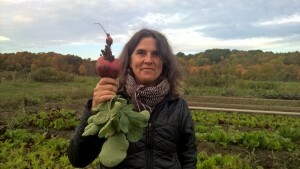 Claudia brings over 20 years of experience as a farmer and sustainable food system activist. She and her husband own and operate Little Seed Gardens, a 97-acre family farm in the Hudson Valley region. 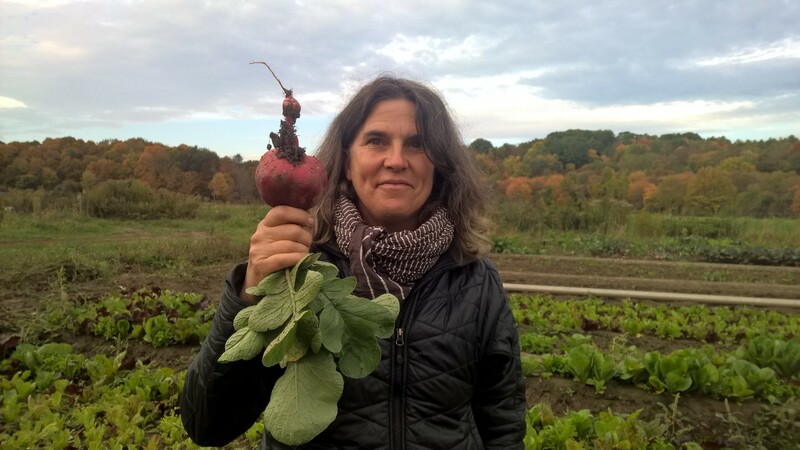 Claudia has worked on agriculture related projects with diverse stakeholders and has been a mentor to young farmers on farm as well as through the Northeast Organic Farming Association of New York mentoring programs. Claudia obtained her master’s degree in conflict resolution with a concentration in environmental conflict from Antioch University Midwest. She is also a graduate of Mediate Your Life where she was trained in compassionate communication and mediation. “We are delighted that Claudia is joining our organization. Her combined background is perfect for this position. We look forward to her leadership role and vision for ensuring that mediation will be useful to folks in the agricultural community in resolving conflict, making collaborative plans, and preserving important business and personal relationships.” Charlotte Carter, Executive Director of the New York State Dispute Resolution Association, Inc.­ NYSAMP is one of several state wide dispute resolution programs administered by NYSDRA. The mediation community in New York is mourning the loss of one of our favorite people. Peter Glassman was a consummate advocate, practitioner and trainer; his warm light touch and devotion to social justice was a joy and inspiration to many of us. Peter’s respect, genuine interest and gentle guidance inspired a remarkable level of loyalty and commitment in the people who were fortunate to work with him, especially at Mediation Matters and NYSDRA. I’ve heard that respect and admiration echoed by many who attended his trainings and workshops over many years. My own relationship with Peter began decades ago when I was a fledgling, an somewhat overly enthusiastic, community volunteer. He was willing to trust my good intentions and to indulge me in my desire for discussion and debate. He was one of my first mentors as a trainer, and supported me in my professional growth. Once he nearly hired me. Just a few years ago, Peter made a significant change in his professional trajectory and adopted the NYS Agricultural Mediation Program. This flip-flop in our own relationship amused us no end. I wondered how his distinctive style and penchant for quirky humor would fly with the larger agricultural community. I guessed that many farmers would appreciate him, and I was curious about how some of the senior staff at the USDA and Department of Agriculture might react. The chemistry was there from the start, and we’ve received many inquiries and expressions of concern and appreciation from his newest community. My own sense of gratitude for the great good fortune to have worked so closely with Peter overwhelms me during these dark times of shock and loss. I’m grateful to Elyn Zimmerman, Peter’s wonderful and amazing wife, who was able to navigate the difficult journey they were forced to embark. She was also able to open her aching heart to include many of us from Peter’s work life. I will be eternally grateful that the stars aligned to allow me to take my friendship and professional relationship with Peter to a whole new level. On the other hand, I’m furious at the universe, or at least at the random laws of the universe, that allows a few tiny cells to misbehave and create such mayhem and pain and loss. Peter opened our last conversation with a phrase I’m guessing he had used in other similar encounters: “I don’t even know where to begin and end with you." To read Peter’s obituary and provide condolences to his family, please click here. NYSAMP is a vibrant statewide mediation service dedicated to providing free and low cost mediation and conflict resolution services to farmers, agribusiness, and rural communities. NYSAMP is seeking a highly motivated and qualified individual with exceptional interpersonal, leadership, organizational, and program development skills to oversee the continued growth and development of this nationally recognized program. Develop and implement marketing and public awareness efforts utilizing print and social media. 2. experience implementing or overseeing dispute resolution programming. Desired Qualifications: Supervisory experience, training experience, and knowledge of local community dispute resolution centers. NYSAMP is a program of the New York State Dispute Resolution Association, the leading membership association in New York for dispute resolution professionals, and an administrator of several statewide dispute resolution programs. The NYSDRA offices are located at 4 Pine West Plaza, Suite 411, Albany NY. Mediation Matters has a new position that will coordinate conflict resolution and restorative justice programs for youth and their communities. This position reports to the Executive Director and is funded by a grant from the Department of Justice and the NYS Unified Court System. Mediation Matters, Inc. was founded in 1979 as a non-profit, community-based organization to provide the skills and processes that help people handle conflict in a constructive way. The Center specializes in providing mediation and conflict resolution skills, training and consulting. Offices are located in Albany, Saratoga Springs, Schenectady, and Glens Falls, NY. Mediation Matters has a strong commitment to serving the diverse communities of the Capital district; applicants who feel they can help us further those goals are strongly encouraged to apply. Depending on experience and qualifications this position may also be responsible for managing associated staff, interns or others supporting the program. Qualifications: Associates Degree or equivalent experience (preference given to those with a degree), demonstrated experience working with youth, training in conflict resolution skills (recommended), computer literacy, good written and oral communication skills, creativity and flexibility. Salary, Hours, and Location: This is a full-time position (full-time for Mediation Matters is 35 hours per week). Salary is commensurate with experience. The position will largely be based in Albany County; all candidates must have the ability to travel throughout Albany, Rensselaer, and Schenectady Counties. Metaphors nourish me, especially in my life as a mediator. In addition to pure pleasure and cognitive calories, they help raise into consciousness some of the mysteries of the mediation process. Against plenty of evidence to the contrary, I live in hope that awareness leads to clarity and effective intervention. One of the ineffables is what happens when the muddle and mess of conflict laid out on the table gradually transforms and emerges as bright new solutions and consensus. After decades of practice it still feels like magic. Mediation allows participants to bridge the gap dividing competition and collaboration, and to reconnect with those preservationist impulses to be kind and generous with one another. Mediator neutrality and respect for self-determination ensures that the people we work with “come about [their] own business.” Seeing a fox stirs us with primal responses; witnessing conflict transformation is also a profound and energizing privilege. I was fortunate to attend the symposium on Restorative Practices for Youth: Building Relationships in Schools, Juvenile Justice, and Communities last week. The event was presented by the Skidmore College Project on Restorative Justice, the newest venture for NYSDRA board member David Karp. The event included a keynote from Margaret Thorsborne, author of Implementing Restorative Practices in Schools (among others) and internationally-known expert on restorative practices. Her simple yet comprehensive approach to a complex topic left the entire audience inspired and energized to see restorative processes utilized more widely in schools and the juvenile justice system. Marg showed the audience the scientific data needed to prove that punishing school children for bad behavior, and a zero-tolerance approach to problem solving, does not work to change that behavior. Instead of behavior management, schools need to focus on relationship management and creating a positive climate for learning. She used humor and simple examples to show how a person is more able to grow and improve when they are valued and invested in. Her keynote set the perfect tone for the symposium’s panel discussions on implementing restorative processes in schools and working with juvenile justice agencies to incorporate these practices. Duke Fisher led a particularly interesting lunchtime activity where attendees were asked to participate in their own circle activity during the meal. It was a way for us to “buy-in” to the process by actually using it. At my table, the educators present were more interested in talking amongst themselves than listening to what others had to say. When we were finally focused around a “talking item”, we were able to really hear each other. It was obvious it would take deliberate practice and further training for any of us to lead such an activity amongst students. Marg also presented a lecture later in the evening on "Understanding the nature of emotional harm: Why restorative problem-solving is good for our brains". We were treated to more light-hearted story-telling while Marg addressed some pretty serious topics. She focused a lot on how negative emotions, when not metabolized, lead to shame. We learned how people’s responses to their own shame can lead to further harm: to self and others. Marg likened our response to a blister on our foot (take off the shoes!) to what should be our response to negative emotions – fix it! Rather than letting the pain and harm continue and fester, a restorative problem-solving approach can allow us to process our negative emotions and move beyond the harm. I was fortunate to attend the New York Council on Nonprofit's (NYCON) Camp Finance in early October: two days of splendid workshops on finance, social media, governance, technology, and accountability & compliance. Even the panel discussions were packed with information and inspiration. We will briefly acknowledge that a couple of days in the Mohonk Mountain House -- with on-beyond amazing food, views and potential for exploring endless trails, gardens, a labyrinth, rooms with porches, rocking chairs and real fireplaces – didn’t hurt either. Very Nourishing. Jay Wilkinson and the folks from Firespring whetted our appetites with a common sense approach to thought leadership and blogging strategies (check out their free online webinars!). Ok, maybe pie making isn’t easy for everyone, but this is worth a try (I’ll even include Lacy’s Impossible Pie, from my school chum. Stay with me.) So, thought leadership requires a commitment to generating great content, becoming an established expert, and inspiring action. This must be true because I heard it first from Carla Schlist, NYSDRA's Membership and Communications Manager. 1. Select a team of 4-5 people who love to write, journal, etc. 5. Repeat Steps 3 & 4 as needed. So are you inspired? Will you act? At least try this easy pie recipe. Mix 2/3 cup milk, ½ cup baking mix, and 2 eggs. Add 2 cups of vegetables cooked or thawed and ½ cup of cheese. Pour into a greased pie pan, and bake at 400° for 30-35 minutes. In October 2013, the American Arbitration Association (AAA) amended the Commercial Rules and made a number of changes. The rules had not been amended for several years. One significant change to the rules was to add the new Rule 9 requiring mandatory mediation for cases where a claim or counterclaim exceeds $75,000. The addition of this rule has had a positive impact with respect to encouraging both mediations and settlements. In all cases where a claim or counterclaim exceeds $75,000, upon the AAA’s administration of the arbitration or at any time while the arbitration is pending, the parties shall mediate their dispute pursuant to the applicable provisions of the AAA’s Commercial Mediation Procedures, or as otherwise agreed by the parties. Absent an agreement of the parties to the contrary, the mediation shall take place concurrently with the arbitration and shall not serve to delay the arbitration proceedings. However, any party to an arbitration may unilaterally opt out of this rule upon notification to the AAA and the other parties to the arbitration. The parties shall confirm the completion of any mediation or any decision to opt out of this rule to the AAA. Unless agreed to by all parties and the mediator, the mediator shall not be appointed as an arbitrator to the case. The AAA saw a 51% increase in commercial mediations from 2013 to 2014 and a large increase in clients opting to mediate after initially filing for arbitration. In 2014, 61% of AAA business-to-business cases were resolved prior to going to award and 43% of those cases were resolved so early that they incurred no arbitrator compensation. There is a clear link between Rule 9 and increases in the AAA mediation caseload and settlements on cases initially filed as arbitrations. Though the parties can opt out of Rule 9, the rule has increased positive mediation dialogue between the AAA, parties and counsel. The rule eliminates the “perception of weakness” concern that some parties and counsel may have about merely starting the conversation about mediation. Mediation is now being deemed an important “step” in the arbitration process with the ultimate goal to potentially reach early settlement and avoid a costly arbitration process. Some parties are even opting for a two track process to conduct a mediation session while simultaneously keeping the arbitration process going. The International Centre for Dispute Resolution (ICDR), the international branch of the AAA, also amended its rules on June 1, 2014 to include discussion about mediation. Following the time for submission of an Answer, the Administrator may invite the parties to mediate in accordance with the ICDR’s International Mediation Rules. At any stage of the proceedings, the parties may agree to mediate in accordance with the ICDR’s International Mediation Rules. Unless the parties agree otherwise, the mediation shall proceed concurrently with arbitration and the mediator shall not be an arbitrator appointed to the case. It is anticipated that this addition to the ICDR rules will also increase mediations. Here is Kacey’s report with a photo! We learned a lot and now have several contacts that we can follow up on. We gathered information about all of the potential people dairy farmers may owe money to, who may owe money to the dairy farmer, running a small family farm, chores, processes, of course cows and strategies on how to build trust with dairy farmers. It was interesting because they kept saying that running a small family farm was like being on an island; people may come and go but you are really just by yourself and kind of cut off from the rest of the world. They talked about the meetings that were held periodically but said that they only go to the one that gives the forecast of what milk prices will be for the year and that they don’t have time to go to the others. On the Right Track? Or, Still Waiting for the Paradigm Shift. Many decades ago, I discovered “ADR” after representing feuding parents in a heartbreaking family court case as part of my law school clinic. The parents used the tools they learned in court to attack each another and maximize damage. Their children suffered with the resulting mental, emotional, and physical manifestations. Two fine institutions - the legal system and the family - were on a disastrous collision course. There had to be a better way to manage parental conflict and to protect children. I spent the next semester reading and writing about ADR. That independent study changed my life goals and direction. It was clear that the legal system, rooted in rights-based litigation, was good at resolving many disputes. However, it was not always suited to resolving conflicts that involved restructuring important relationships. ADR offered potential for collaborative problem solving, and preserving personal and business relationships. Dispute resolution faced legitimate challenges about the delivery of justice, conflict with the mainstream legal community, and problems with scaling up design, funding and implementing of programs. Nevertheless, a shift towards social justice seemed desirable and inevitable. What I do know is that decades of experience as a community mediator and another decade with NYSDRA have only reinforced my early convictions and excitement. My mentors have been the folks who were willing to give it a try. It is a challenge and a privilege to sit with them and witness the hurt, anger, misunderstanding, mistrust, and mean-spiritedness we all feel in conflict. Gradually, the energy shifts in response to the reflections, questions, or interventions that resonate in the room. Surprisingly often, we have the honor to see those same folks reach deep into reservoirs of hope, trust, and creativity that had been temporarily inaccessible. Collaborative problem solving becomes manifest. •	Walk that talk, model that shift: Use mediation in your own life to address unresolved conflict, or for planning purposes, especially where there are complex substantive matters, important relationships and/or high emotions involved. •	Talk the walk: Educate others by catching them doing it right. Notice when people around you are using good skills in communication, negotiation or conflict management. Tell them what they did and why you noticed. (Thank you to Dan Weitz and Sheila Sproule of OCA/ADR for their workshop at NYSDRA’s Annual Conference). •	Promote and challenge: Ask a roomful of mediators if they utilize mediation and how often. (Once for your divorce is not enough!) Urge your family, friends, and acquaintances to use dispute resolution. Look for opportunities to promote mediation to manage conflict and change in your communities. •	Get out of our box: Talk to people in other professions, businesses, or in communities that are different from your own. Ask questions, listen closely, and then explain dispute resolution in new and relevant ways. Lose the jargon. Promote our values, skills, and services with other social causes or charities. •	Stop social grooming and preaching to the converted. Don’t assume that the public or other professionals understand or need your services. Invite yourself to the table. Don’t be neutral about your profession. •	Talk to power: Commit to building awareness and solidarity. Join organizations involved in mediation advocacy and outreach. Communicate regularly with policy and decision makers on every level. What is on your list? What ideas do you have for increasing the effectiveness and visibility of dispute resolution? I’ll be exploring some of the suggestions in more detail in future posts. Please feel free to comment below. I just returned from three days in Baltimore. I was there for a conference of the Coalition for Agriculture Mediation Programs. We were holed up in a downtown hotel – advised not to venture outside while watching horrifying video of ongoing mayhem on the local news. Police, fire and military vehicles could be frequently seen and heard speeding by on downtown streets. The irony was not lost on us that we had traveled from around the country to share our skills and experiences in conflict management while violent conflict raged around us. And yet we dared not venture outside. Hotel staff spoke of lifetimes of experiences with the Baltimore police ranging from disrespectful to appalling. When the conference ended on Wednesday, I ventured down to the Inner Harbor. Many Baltimoreans complain about the amount of development dollars that have been plowed into this slick, touristy area, while blight and decay overtake most other neighborhoods in the city. An Orioles game at nearby Camden Yards was played in the stadium’s empty, cavernous expanse. The game was closed to the public for safety reasons. Interesting business model. There, amidst the pristine streets, glitzy Anne Taylors and Cheesecake Factorys, were hundreds of National Guard soldiers armed with automatic weapons. Humvees were ostentatiously parked everywhere. People cheerfully approached these soldiers to snap selfies. A bonus tourist attraction. Though I have lots of strong opinions on the state of race and the criminal justice system in our country – I will demur for now. What I’d like to share is how bizarre and disconcerting these images were. How quickly curfews and militarization can become the new normal. And how chilling that prospect is. I mused for a bit on the toxic level of injustice and inequality that is underscored by the contrast among the gorgeous Inner Harbor, the presence of military personnel and equipment, and the poverty, blight and hopelessness that exists mere blocks away. I cogitated on the role we as dispute resolution professionals could play in righting these wrongs. Then I went to the Aquarium. One in four kids in the U.S. is bullied on a regular basis. That’s bad enough, but what’s worse is that according to several studies, the rates are usually two to three times higher, for children with special needs. In nearby Connecticut, more than 50 percent of tracked bullying reports involved a student with a disability or an IEP. While more and more schools are developing anti-bullying programs and policies, there’s still a great deal of work to be done, particularly for kids with special needs. For many of these kids, their parents will always remain their primary advocate. The good news is, there are proactive steps that parents can take to protect their kids and create a healthier, more accepting environment in their schools and communities. How Do You Know If It’s Bullying? Bullying is defined as behavior that is intentional, aggressive and negative, carried out repeatedly against one or more targets. Bullying occurs in relationships where there is an imbalance of power between the parties involved. Evaluating the balance of power in a conflict is often the best way to identify bullying versus teasing. If one party is afraid of the other, it’s more likely to be a bullying situation. When a child has special needs, it can be especially hard to tell what is really going on. Kids with physical, developmental, intellectual, behavioral, sensory disabilities and even allergies are more likely to be bullied than others. Studies indicate that when kids have visible physical disabilities, they are more likely to be victimized. In addition, children with special needs often have a lower baseline social standing than their fellow students, which makes them more vulnerable from the start. When part of a child’s condition includes social challenges, such as autism, Social Communication Disorder (formerly Asperger’s syndrome), and ADD or ADHD (Attention Deficit Hyperactivity Disorder), the problem is intensified. Kids who have trouble holding conversations or making friends, or who have a low frustration threshold, are prime targets. Ironically, the recent inclusion movement in schools may have actually made students with special needs more vulnerable. Special classes, aides, and technological equipment highlight the fact that these students are “different.” And being “different” can set kids up not only for social ostracism, but as the go-to target of bullies. Become reluctant to go to school. Start eating or sleeping poorly, or too much. Lose interest in classwork and slip academically. Lose interest in friends and favorite activities. Become moody or get upset easily. Regress in toileting and other skills. Complain of headaches or stomach aches. Cuts, bruises, or injuries that weren’t there in the morning. If you suspect your child may be the target of bullying, document the situation and bring it to the attention of their teacher(s) and Principal. 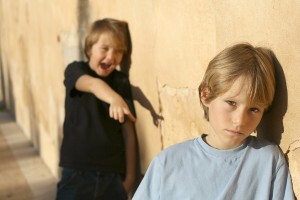 For more tips about how to handle bullying situations, visit www.tarafishler.com.